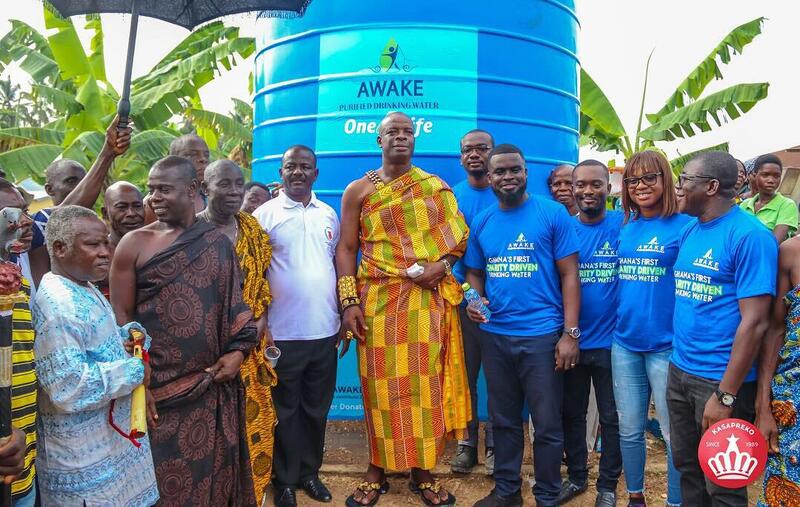 As part of this year’s World Water Day celebration, Awake purified drinking water has donated merchanized boreholes and polytanks to two communities, Awutu Ayensuako and Okwamapa in the Central Region . The distributors and producers of the drinking water said during the donation that, they decided to do donate to these communities after watching a documentary on government owned television station GTV about how the inhabitants of the above-mentioned communities lack potable water and depending solely on River Ayensu at its source of water. According to Isaac Adjei the company’s director, they decided to upgrade the existing boreholes in the said communities and also support them with a big storage which stores over 10,000 liters of water . “We have outsourced an engineer and paid him fully with a mandate to supervise the the projects for an estimated period of three weeks”, he explained. He continued that All the money they are using on the project is from Ghanaians , through Awake Water, Ghana’s first charity-driven water. He added that they are able to make such donations by the kind customer commitment exhibited by Ghanaians. “For every bottle of Awake Mineral Water purchased, the company donates one pesewa to the Center.The quarterly donation is aimed at paying for the medical bills of patients at the Center who require financial support to fully pay for their surgery or treatment.